Ah, it's that time of the year again: law reviews are beginning to hand out invitations to incoming second years. Congratulations to you all. Law review's a great honor and a great learning experience. Students benefit from the experience of performing close reads on the articles they're cite-checking and editing; they can learn a lot from the writing experience as well, including working closely with faculty members on their notes. How do I know that law reviews are handing out offers? I'm beginning to get questions from students asking for helping in selecting a note topic. (This time it's from my students at the University of Hawaii.) And so it begins again. Lo' those many years ago Eben Moglen suggested a topic to me, on federalism in the Taney Court. I am eternally grateful to him. And over the years I've suggested a bunch of topics to students. Some of the better ones in recent years include Amy Wilson's on the jazz influence in property law (got to read it--I'm not going to give away the punchline); Kitty Rogers' on integrating the city of the dead (catchy title, eh? 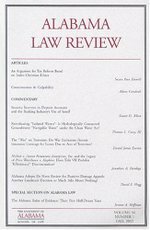 ); Leah Green's on the Erie Canal in American legal thought; Elizabeth Bates on statutes of limitations for reclamation of artwork produced by slaves; Chris Williams on an empirical study of smart growth; and Fred Wright's on the effect of New Deal residential finance and foreclosure policies on property law. The key to a good student note topic is: that it's do-able over the course of the second year. What's that mean? First, it's a topic that hasn't yet been over-written. That means stay away from takings (exception to follow). Some years ago one of my favorite students of all time asked me about writing on takings. And I said, well, spend the weekend looking at what's been done and reading (the then most recent case), Palazzolo and if you can find something new to say, let me know. So the next week she said, "seems like everything has been taken. [pause] I guess that was your point." That means that narrow doctrinal topics are really good; brief empirical pieces, are also very good. And I think historical pieces are ideal, because there is so much that's left to be said about legal history. Talk to people at work; often times, the best note ideas come from practicing attorneys who see issues as they're just beginning to make their way through litigation. Here are a few things that are on my mind this summer, which might be good student note topics. Just remember, you got these ideas from Brophy. I want credit for this stuff; at least thank me in a footnote. First--and breaking the rule against takings: there are a couple of places in takings where we student work could help us. What procedures have state courts developed to protect against abuses of public use. Some years ago Thomas Merrill published an important study in the Cornell Law Review on this. I think there's a lot to do with this at the state level. Third, we could use some recent empirical work on how the restatement (third) of servitudes has been interpreted by state courts. How's the progress on replacing touch and concern with a more general "reasonableness" inquiry going? Fourth, doctrinal notes are very helpful and are actually cited. What are the areas of property doctrine that could use updating? I think there's some good work to be done on recent cases on damages for breach of land sale contracts (and specific performance). But there are plenty of places where we could use some more work, especially in property and equity (like agreed boundaries and easements by estoppel). Fifth, I think we need to know more about the process by which southern courts pursued the process of integration--libraries and swimming pools are both great subjects for study. And they're self-limiting: you can collect all the cases in which libraries or pools were integrated quickly. Then it's a process of figuring out what they meant. Sixth, property and equity is a topic of growing importance. For instance, are we seeing state courts beginning to limit constructive trusts? Are courts changing their attitudes towards injunctions for violations of servitudes? Are courts invoking property rules or liability rules with more frequency? Are they changing their frequency for invoking either? Seventh, you might take advantage of the miracle of full-text searching on lexis and westlaw and study how various phrases have been used. When do courts criticize something as feudal, for instance. Or you might take a page from Randall Kennedy's book on the n-word and make a comprehensive study of how courts have reacted to the n-word. Eight, if you're thinking about case notes, I recommend a serious look at Jones v. Flowers. There's some great work to be done on comparing the rhetoric of Jones and Kelo. I have some comments on that here. And now this good news, that Eugene Volokh and the UCLA law library have opened a website, lawtopic.com, which is a clearinghouse for law review topics. That's a great contribution to the community; I appreciate their generosity. Another Update: Here is a link to Stanford Law Review's memo on note topics. I thought you might find it of some interest. And here is a link to University of California, Hastings Professor Roger C. Park's lengthy list of note topics.